Yesterday, I wrote about garden pesticides, so I figure today I might as well cover chemical fertilizers. Just like pesticides, I used to use these fertilizers all the time as a landscaper and on the golf course. Even today, there are a couple of lesser-known chemical fertilizers that can be extremely useful in an otherwise organic garden when you’re trying to bring back a badly abused soil. But for the most part, I prefer to stay away from them. What’s Wrong With Chemical Fertilizers? When we look at chemical fertilizer and the environment, the interesting thing is that some of them are potentially just as damaging to the soil as pesticides. They can undergo chemical reactions in the soil that can produce acids with a pH lower than 1.2 or bases with a pH above 11, both of which are extremely toxic to pretty much any living being. Even the chemical fertilizers themselves can either destroy or interfere with the cell walls of microbes, hurting or killing them. On top of that, many synthetic fertilizers contain a lot of hydrogen, which kicks minerals out of the soil, depleting the soil of nutrients with repeated use. Plants and microbes use hydrogen for this purpose, too, but in a much more controlled fashion. Interestingly, oxygen produces one of the detrimental chemical fertilizer effects. It’s created during this chemical reaction and organic matter is burned up. Some synthetic fertilizers even include (or form) formaldehyde, which does the same thing in the soil that it did in your high school biology class when you used it to preserve specimens. In order to cut costs, manufacturers may use spent acid, a by-product of washing metals, which means the fertilizer has a lot of heavy metals, which are toxic. Chemical fertilizers are mostly nitrogen, phosphorus and potassium. Consistent applications of these nutrients at the expense of the dozens of others that are needed creates an imbalanced soil environment, not to mention the sewage sludge and toxic metals and all kinds of other garbage that are often included in the fertilizers as filler. Most of the nitrogen and some of the phosphorus and potassium may leach into our waterways causing all kinds of problems to the greater environment. The manufacturers eventually started coating the chemical fertilizer with nutrients such as chemical sulfur to decrease this problem by making the fertilizer more “slow-release”. This sounds like a great fix on the surface, except when heavy doses of sulfur combine with water to produce sulfuric acid and kill soil life. The above problems can be largely avoided by using only high-quality fertilizers, and in the amounts your soil needs (not too much of anything). While there are a couple of chemical fertilizers that may actually be useful once in a while, we must definitely stop using the traditional npk fertilizer products such as urea formaldehyde, triple superphosphate (0-46-0), and potassium chloride (0-0-60, which is 40-50% chloride). These are what make up many of the conventional nitrogen-phosphorus-potassium (N-P-K) fertilizers, such as 10-10-10, and they are extremely toxic. The chemical fertilizer industry would have us believe that plants prefer taking up their chemicals in ionic form, which means as molecules or elements with a positive or negative charge, such as calcium as C++ or sulfate as SO4–. Plants certainly take up ionic chemicals, but they also take up complex organic molecules and prefer natural sources of vitamins and other substances to synthetic sources, just as our bodies do. For the most part, if you don’t use pesticides, make sure you don’t use chemical fertilizers, either, especially the N-P-K brands from your local garden center. Stick to organic fertilizers, especially those I recommend on this site. What about fertilizers that says it’s organic? I just bought An organic something for my blueberry plant (it’s really for rhododendrons). We can definitely use organic fertilizers. You have to be sure that it is indeed organic (not “organic-based”). And you want to be sure that you actually need it. Fertilizers for the rhodo family are basically a marketing ploy. The main thing they really need is a soil very rich in organic matter. But if you already have your fertilizer and it is indeed organic, it probably won’t hurt your plants to use a little. Not too much. 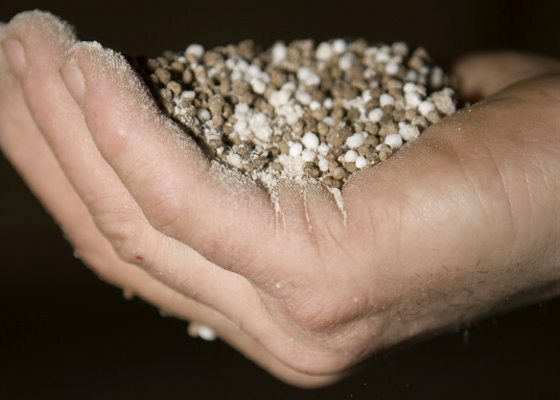 The problem with a lot of these fertilizers is they’re using genetically modified ingredients (seed meals), bone and blood meal (which can be problematic), and other mineral fertilizers that your soil doesn’t necessarily need. That’s why I go into detail in the book and in the academy on soil testing to find out what you actually need, and on organic fertilizers that are useful for the entire garden. I know Phil will have a wise answer for you, but just wanted to say your question made me remember the wonderful motto of old-time organic growers: Feed the Soil, Not the Plant. Just in time remembering useful for the online gardening class I’ve just started. Check it out at http://www.gaiacollege.ca. Only the first week but incredible, useful, intense course so far. Another downside to the super high N fertilizers is that they can be used to make bombs and crystal meth. Do you have a post about the problems with blood and bone meal? I’ve used these for some time, thinking they were better than other kinds of fertilizers. I’d like to know more.